See the file LICENSE for the license governing this code. 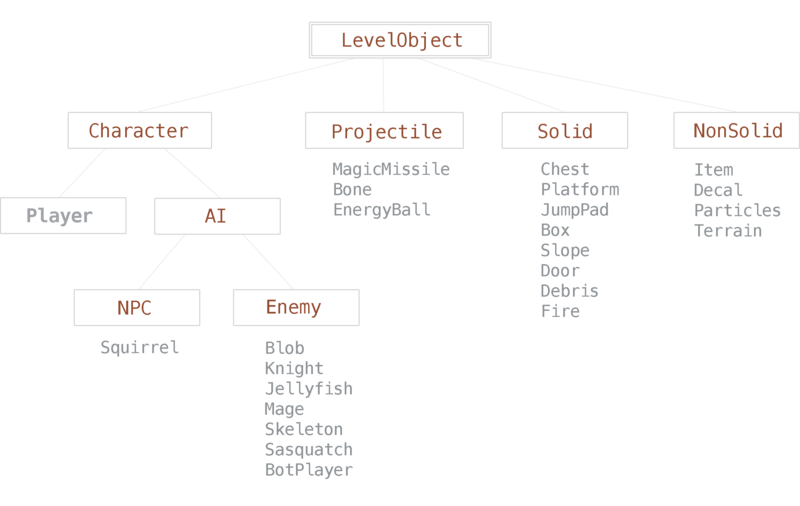 Character represents a LevelObject that has hitpoints. Characters are alive. They can take damage, react and become invincible for a time. Use tmx object property hp (integer) to specify the amount of hitpoints and max hitpoints the character has. Use tmx property damage (integer) to specify the amount of damage this character deals. Set properties for this character. Create the character’s physical body. Adds fixtures to the character’s physical body. Return true if the character is alive. Return true if the character is invincible. React by setting a velocity and duration during which the character cannot be controlled. Used to create “knock back” effects. Duration is controlled via the member reactionDuration. Return true if the character is reacting. Take damage from the given LevelObject. The object is queried for how much damage it deals. Called when the character’s hitpoints have reached zero. Used to disable the character. Called when the character dies and also when the level is loaded and it is determined that the character is already dead. Tick and animate the character. How much health this character has. The maximum amount of health this character can have. The amount of time the character is invincible after taking damage. Timer for reaction (character not meant to change velocity during reaction).